A well-maintained heating system will not only last a long time, it’ll also help minimize efficiency loss. Here are a few things you can do to extend the life of your heating system. 4. Keep the heat exchanger clean to maintain heating levels. 5. Keep your air vents clear. If you have curtains or furniture in front of your air vents, move them away to ensure that heat is able to enter the room. The more efficient your combustion heating appliance (e.g., furnace or boiler) is at converting fuel to heat, the more heat you’ll retain in your home. Efficiency is measured by its AFUE—Annual Fuel Utilization Efficiency. The AFUE is found when you divide the annual fossil fuel energy your appliance consumes by how efficient it is at converting energy from its fuel to heat. 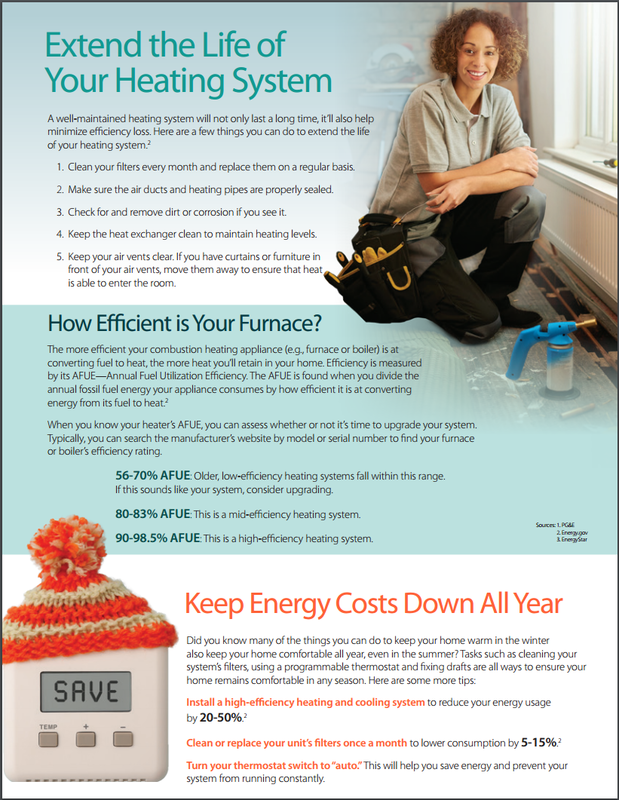 Install a high-efficiency heating and cooling system to reduce your energy usage by 20-50%. Clean or replace your unit’s filters once a month to lower consumption by 5-15%. Turn your thermostat switch to “auto.” This will help you save energy and prevent your system from running constantly.